Its great to see that Mercedes is continuing to produce a wagon for the North American market to continuing giving consumer’s options for more capacity than going down the SUV route. Similar to its competition like Audi in the wagon space, Mercedes is now planning on producing an All Terrain E Class wagon which will compete directly with the A6 Allroad from Audi. You might be thinking that we don’t get the A6 Allroad in North America, and you would be right. That also means that the Mercedes E Class All Terrain is also not slated for North American consumers which is a bummer. The All Terrain Mercedes E Class Wagon will have a raised ride height to allow the vehicle more road clearance should you decide to take the luxury wagon off the paved road. To continue with the All Terrain look, plastic body cladding and underbody protection will offer the wagon with more protection and also give off that rugged look. With the SUV market in North America being in hot demand, this would inevitably curb the rise of the wagon market. Maybe it’s the size, or the carrying capacity for the families, or the offroad capabilities of SUVs and the vast amount of back country trails in North America to enjoy, but the SUV market is big, and it feeds the appetite of a large number of consumers. So when news came from GM correspondents at the annual Buick GMC dealer meeting last week that a wagon will join the Regal lineup in 2018, that was refreshing news. Our European counterparts have some of the best wagons on the market from manufacturers like Audi and Mercedes. Over here, we get the more economical versions of wagons. 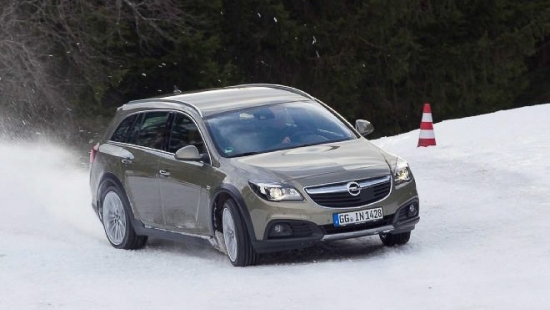 The Buick wagon is expected in North America as a rebadged Opel Insignia Sports Tourer. No powertrain info was offered, but don’t expect it to stray too far from the regular Regal. The Volkswagen Corrado quickly became an enthusiast car and also drew a large fan base becoming quite the cult car. With a coupe design, and Volkswagen’s torquey VR6 motor stuffed up front, as well as a supercharged four cylinder variant, the Corrado was both good to look at and a fast and capable performance car. When it was retired in the 90’s it quickly became missed by all. So anything Corrado these days is rare, especially a good condition one. 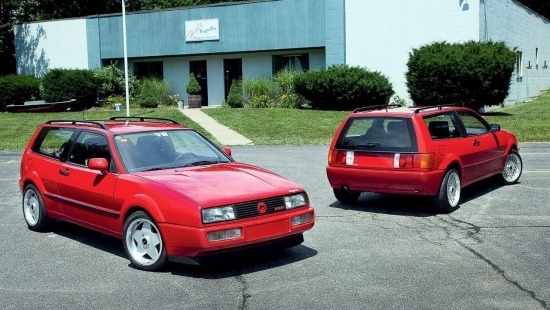 However, even more rare are the two wagon like prototypes which shows what the Corrado could’ve become. The prototypes were commissioned by Volkswagen in the 80’s as a limited edition sportwagen which were built by Marold Automobili GmbH. The two models were dubbed the “Magnum Sport Kombi” and these are the only two cars ever to be produced. When the sportwagen concept project was abandoned, these two vehicles were locked up and then later put up for sale at 3.2 million Deutschmarks. Well, they didn’t go anywhere and only recently popped back up on the market. John Kuitwaard of the Corrado Club of America caught wind of the cars put the money down to buy them. The next problem, bringing them into the US. This ended up to be a much larger task than first thought as all importation regulations created nothing but road blocks. Except for the 25 year rule, which is when the vehicles could be officially imported into the US legally. In 2014, the cars were officially brought into the US and have made their way around the show circuit. They are now up for sale as well at just under $50,000 a pop. You mention station wagon, and the image it usually conjures up is a squared off family hauler packed to the ninth with camping gear heading off for a summer weekend from surburbia. Well, station wagons have come a long way, just ask the up and coming 604hp AMG E63 wagon, but nonetheless the demand is not improving. But interestingly, when you use a name like “Shooting Brake” in place of the station wagon nomenclature, there seems to be a bit more appetite. Seen here is a concept rendition of Toyota’s 86 as a shooting brake which, to me, has huge potential. But don’t hold your breath as Toyota has no plans to put this more practical version of the 86 into production. The concept image shows a car with the same wheel base, but the roofline of the 86/BRZ has been extended to create the wagon rear section. 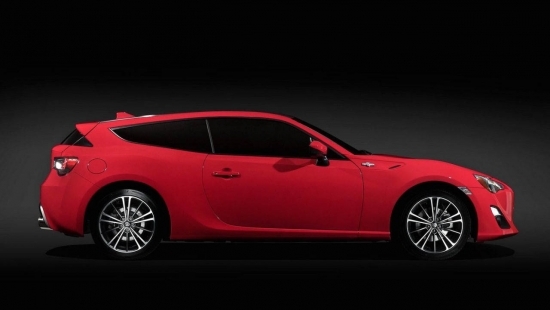 With some wishful thinking, one can hope that they may see a shooting brake 86 on the road some day. As a wagon fan myself, I appreciate the uniqueness of its functionality matched with the 86’s typical performance oriented character. Shooting brakes, or wagons as we know it in North America, isn’t a big market that the automakers have tapped into as the demand by customers is really calling for more SUVs. 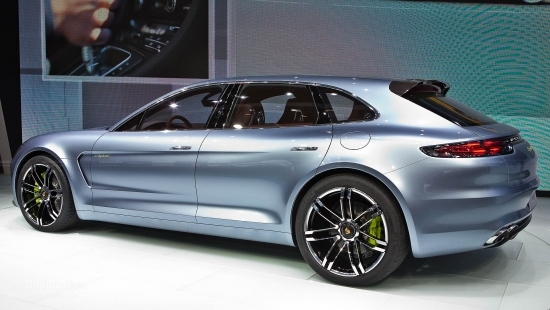 This makes Porsche’s announcement that they will be brining the Panamara Shooting Brake to North America that much more interesting. According to Klaus Zellmer, CEO of Porsche Cars of North America, he says that “We have to have some patience for the wagon to arrive in the U.S. But we are confident that this car will be well received here, despite the fact that this country doesn’t really like hatchbacks or wagons.” Zellmer goes on to hint that the Panamara Shooting Brake may find its way to dealership as early as 2018. Well, thankfully with that said, we can expect some more family haulers to come out of the Jaguar pipeline in the future. Jaguar’s XF Sportbrake and XFR-S performance spec were the first two wagons to be produced by the company and it certainly showed us what we can look forward to from the automaker. 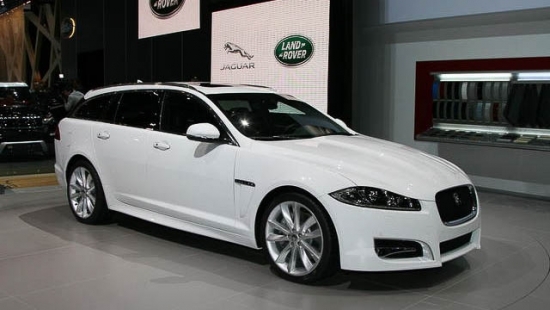 Maybe one day we can even find one of those F-type 500hp V8’s shoved into the front end of a Jaguar wagon. We won’t get out hopes up and most wagons produced for the European market never makes it way to North American shores. 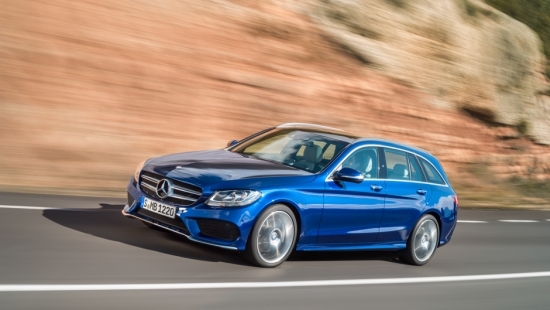 If Mercedes can make an AMG wagon family hauler, why can’t Lexus? And what better platform to use than the LC500. One can dream, but for the time being, here’s a render of what that might look like to curb our hunger and lust for such a car. 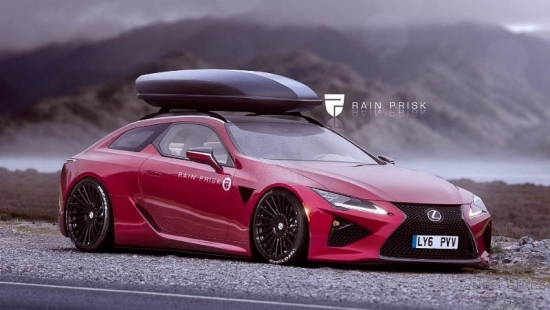 Designer Rain Prisk has took it upon himself to dream up a concept Lexus LC500 wagon and the end result of his handy work is nothing short of amazing. Prisk redesigned the car from the C pillars back to incorporate a covered trunk section. The front has also been digitally massaged to incorporate larger side vents similar to those found on the LFA. The Lexus LC500 is a very capable vehicle as it is powered by a 5.0L V8 engine with 467hp and 389 lb/ft of torque. The LC500 will also use Lexus’ bran new ten speed automatic transmission. The platform that the LC500 sits on is also brand new. It will be shared with other cars in the Lexus lineup, but we are hoping to see it be used to bring out the next generation Toyota Supra. 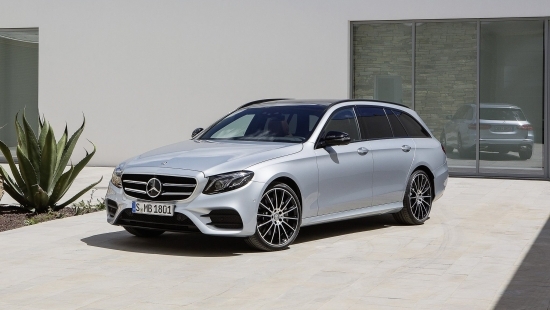 Minivans have always been associated with soccer moms, but for those soccer dads there’s always the Mercedes AMG E63 wagon to satisfy our performance hungers. The AMG E63 is undoubtedly one of the most powerful vehicles in its class. 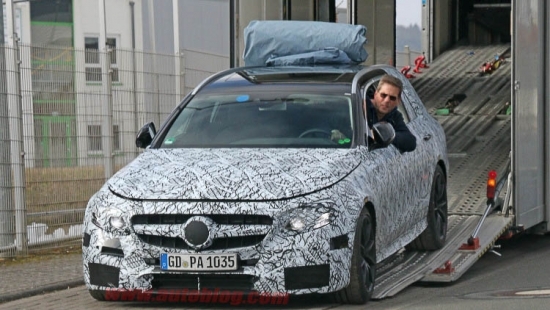 Mercedes is about to release an all new version to the public, but for now, we’ll just have to be patient and feast our eyes on some spy photos (photo cred: Autoblog). The new E63 wagon is still wearing its spy gear, but we can generally see some of it’s design details and overall dimensions. The front facia doesn’t look like it will be a unique piece specifically for the high powered wagon with extra venting for the big motor. The fenders are subtle and don’t immediate say “flare”, but a glimpse at the wide tires tell the tale of some big wide fenders. The rear profile looks a little softer than the current generation E63 Wagon. The production model will likely use Mercedes 4.0L twin turbo V8 but more highly tuned for the big body wagon. No power output has been released but we’d expect it to be somewhere near the 600hp mark. As with previous AMG models, the E63 will likely have large performance brakes, and a sport tuned exhaust with Mercedes signature angular quad exhaust tips. Volvo debuted their all new S90 luxury sedan to the world at the Detroit Auto Show earlier this year and it was very well received. 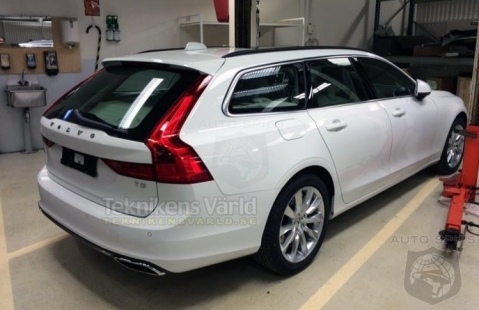 Thanks to a commonly shared platform with the XC90, Volvo is now also able to offer up a third variant to wear the “90” label in the form of the V90 wagon which will debut on February 18 (photo cred: teknikensvarld.se). It isn’t surprising that Volvo is building another wagon given that the Swedish automaker is known for their iconic family haulers. However, gone is the image of a school teacher wearing a plaid jacket with elbow pads. Today’s V90 is a statement of luxury and utility packaged into one. With the North American market choosing SUVs over wagons, only time will tell how well the new V90 will do. But what we are seeing more and more today from automakers is a “crossover” wagon in the likes of Volvo’s Cross Country, Audi’s Allroad and Volkswagen’s Alltrack. Given that most small SUV owners don’t take their cars offroad, and that wagons built on their shared platforms typically offer more space, here’s hoping that the wagon market picks up steam in the years to come.